Happy birthday to the very lovely fififolle. This... isn't actually your birthday present, but it became obvious at the weekend that I wasn't going to get a fic finished in time, and after last year's epic lateness I was determined to post *something* on your birthday, so here it is. 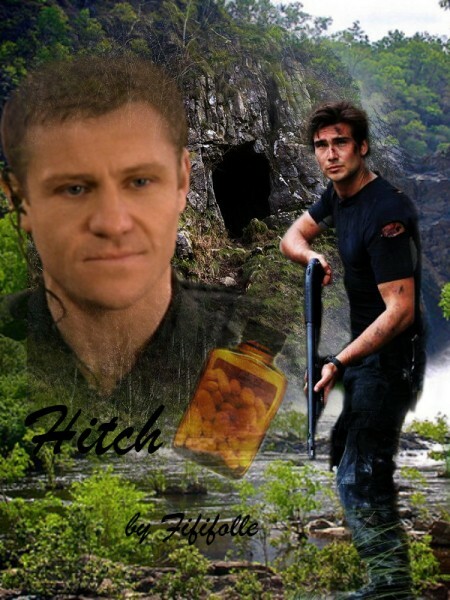 This is an e-book cover for Hitch by fififolle. Warning: fic contains alpha/beta/omega!au and mpreg, although the cover art itself is pretty safe. Oh wow. Thank you so much! That is just perfect. And totally accidental mating for life, haha. Thanks, hope you had a lovely birthday. There had to be the cave, it was important (I may have been re-reading that series to remind myself at the weekend :-)). Yes, as soon as I saw that hurt/comfort prompt I thought of pup!verse. I just hadn't decided what to do with it until very recently.